A mobile operating system (or mobile OS) is an operating system for phones, tablets, smartwatches, or other mobile devices. While computers such as typical laptops are 'mobile', the operating systems usually used on them are not considered mobile ones, as they were originally designed for desktop computers that historically did not have or need specific mobile features. This distinction is becoming blurred in some newer operating systems that are hybrids made for both uses. Mobile operating systems combine features of a personal computer operating system with other features useful for mobile or handheld use; usually including, and most of the following considered essential in modern mobile systems; a wireless inbuilt modem and SIM tray for telephony and data connection, a touchscreen, cellular, Bluetooth, Wi-Fi Protected Access, Wi-Fi, Global Positioning System (GPS) mobile navigation, video- and single-frame picture cameras, speech recognition, voice recorder, music player, near field communication, and infrared blaster. By Q1 2018, over 383 million smartphones were sold with 86.2 percent running Android and 12.9 percent running iOS. Android alone is more popular than the popular desktop operating system Windows, and in general smartphone use (even without tablets) outnumber desktop use. Mobile devices with mobile communications abilities (e.g., smartphones) contain two mobile operating systems – the main user-facing software platform is supplemented by a second low-level proprietary real-time operating system which operates the radio and other hardware. Research has shown that these low-level systems may contain a range of security vulnerabilities permitting malicious base stations to gain high levels of control over the mobile device. Mobile operating systems have majority use since 2017 (measured by web use); with even only the smartphones running them (excluding tablets) more used than any other kind of device. Thus traditional desktop OS is now a minority used kind of OS; see usage share of operating systems. However, variations occur in popularity by regions, while desktop-minority also applies on some days in regions such as United States and United Kingdom. 1973–1993 – Mobile phones use embedded systems to control operation. 1993 – Apple launch Newton OS running on their Newton series of portable computers. 1994 – The first smartphone, the IBM Simon, has a touchscreen, email, and PDA features. 1996 – Palm Pilot 1000 personal digital assistant is introduced with the Palm OS mobile operating system. 1998 – Symbian Ltd. has developed Symbian OS. Symbian was used by many major mobile phone brands, and above all by Nokia. 1999 – Nokia S40 Platform is introduced officially along with the Nokia 7110. 2000 – Symbian becomes the first modern mobile OS on a smartphone with the launch of the Ericsson R380. 2001 – The Kyocera 6035 is the first smartphone with Palm OS. Microsoft's first Windows CE (Pocket PC) smartphones are introduced. BlackBerry releases its first smartphone. 2005 – Nokia introduces Maemo OS on the first Internet tablet N770. Apple iPhone with iOS is introduced as an iPod, "mobile phone" and "Internet communicator". Open Handset Alliance (OHA) formed by Google, HTC, Sony, Dell, Intel, Motorola, Samsung, LG, etc. 2008 – OHA releases Android (based on Linux kernel) 1.0 with the HTC Dream (T-Mobile G1) as the first Android phone. Palm introduces webOS with the Palm Pre. By 2012, webOS devices were discontinued. Samsung announces the Bada OS with the introduction of the Samsung S8500. November – Windows Phone OS phones are released but are not compatible with the prior Windows Mobile OS. July – MeeGo, a mobile Linux distribution, combining Maemo and Moblin, is introduced with the Nokia N9, a collaboration of Nokia, Intel, and Linux Foundation. September – Samsung, Intel, and the Linux Foundation announced that their efforts will shift from Bada, MeeGo to Tizen during 2011 and 2012. July – Mozilla announced that the project formerly named Boot to Gecko (which was built atop an Android Linux kernel using Android drivers and services; however it used no Java-like code of Android) was now Firefox OS (since discontinued) and had several handset OEMs on board. September – Apple releases iOS 6. January – BlackBerry releases their new operating system for smartphones, BlackBerry 10 but are not compatible with the prior BlackBerry OS. September – Apple releases iOS 7. Canonical announced Ubuntu Touch (later discontinued), a version of the Linux distribution expressly designed for smartphones. The OS is built on the Android Linux kernel, using Android drivers and services, but does not use any of the Java-like code of Android. Google releases Android KitKat 4.4. November – Google releases Android 5.0 "Lollipop"
February – Google releases Android 5.1 "Lollipop". Google releases Android 6.0 "Marshmallow". October – On October 26, BlackBerry announced that there are no plans to release new APIs and software development kits for BlackBerry 10, future updates would focus on security and privacy enhancements only. November – Microsoft releases Windows 10 Mobile. February – Microsoft released Windows 10 Mobile Anniversary Update. June – Apple announced iOS 10. August – Google posted the Fuchsia source code on GitHub. August – Google released Android 7.0 "Nougat". September – Apple released iOS 10. November – Tizen released Tizen 3.0. November – BlackBerry released BlackBerry 10.3.3. April – Microsoft released Windows 10 Mobile Creators Update. May – Samsung announced Tizen 4.0 at Tizen Developer Conference 2017. August – Google released Android 8.0 "Oreo". August – BlackBerry announced the Android-based BlackBerry Secure which focus on security. September – Apple introduces the iPhone 8, iPhone X, and iOS 11. October – On October 8, Microsoft announced that development of Windows 10 Mobile will be on maintenance mode only, thus there won't be any new feature would introduce to Windows 10 Mobile. February - Xiaomi backed Huami officially introduce both the Android-based and proprietary of their Amazfit OS together with their smartwatch, the Amazfit Pace (Android based) and Amazfit Bip (Proprietary) for the global market. March – Google and partners officially launched Android Go (based on Android "Oreo" 8.1 but tailored for low-end devices) with Nokia 1, Alcatel 1X, ZTE Tempo Go, General Mobile 8 Go, Micromax Bharat Go and Lava Z50. March – Google release Android "P" as a developer preview. April – Microsoft release Windows 10 Version 1803 "April 2018 Update". May - Huawei release LiteOS version 2.1. June – Apple announced iOS 12. August – Google releases Android 9.0 "Pie". August – Xiaomi officially introduce MIUI for POCO for their Poco series smartphone. August - Samsung officially introduce Tizen 4.0 with the release of Samsung Galaxy Watch series. September – Huawei releases EMUI 9.0. October – Microsoft release Windows 10 Version 1809 "October 2018 Update". November - Samsung announce the One UI as the latest version of the Samsung Experience UI. These operating systems often run atop baseband or other real time operating systems that handle hardware aspects of the phone. Android (based on the modified Linux kernel) is a mobile operating system developed by Google Inc. Besides having the largest installed base worldwide on smartphones, it is also the most popular operating system for general purpose computers (a category that includes desktop computers and mobile devices), even though Android is not a popular operating system for regular (desktop) personal computers (PCs). Although the Android operating system is free and open-source software, in devices sold, much of the software bundled with it (including Google apps and vendor-installed software) is proprietary software and closed source. Android's releases before 2.0 (1.0, 1.5, 1.6) were used exclusively on mobile phones. Android 2.x releases were mostly used for mobile phones but also some tablets, Android 3.0 was a tablet-oriented release and does not officially run on mobile phones, while both phone and tablet compatibility was merged with Android 4.0. The current Android version is 9.0 Pie. Android One is a software experience that run on the unmodified Android operating system, which closely resembled those which running on Pixel devices or previously, the Google Nexus program. Unlike most of the "stock" Android that running on the market, Android One UI closely resemble of the Pixel UI, due to Android One program are software experience that develop by Google and distribute to partner who signup for the program, such as Nokia and Xiaomi. Thus, the overall UI are intended to be clean as possible (Intended by Google), while OEM partners may tweak or add additional apps such as camera to the firmware, otherwise most of the apps will be handle by Google proprietary apps. The update was handle by Google and will be internally tested by OEM before distribute via OTA update to the end users. Android One version are same as AOSP, starting from Android 5.0 "Lollipop"
Designed by Alibaba, based on Android. Amazfit OS a mobile operating system that are based on Android, it is develop by Xiaomi backed Huami for their higher-end Amazfit series of smartwatch, such as Amazfit Pace, Verge and Stratos. Due to it was Android based operating system, therefore it can be side loaded with Android APK file to run on the smartwatch. Similar to MIUI, although Amazfit OS is based on open source AOSP, it consists of closed source and proprietary software of its own. BlackBerry Secure is an operating system developed by BlackBerry, based on the Android Open Source Project (AOSP). Officially announced the name for their Android based front-end touch interface on August 2017, before the announcement, BlackBerry Secure was running on BlackBerry brand devices such as BlackBerry Priv, DTEK 50/60 and BlackBerry KEYone. Currently, BlackBerry plan to license out the BlackBerry Secure to other OEM's. ColorOS is a custom front-end touch interface, based on the Android Open Source Project (AOSP) and is developed by OPPO Electronics Corp. As of 2016[update], OPPO officially releases ColorOS with every OPPO device, and released an official ROM for the OnePlus One. Emotion User Interface (EMUI) is a front-end touch interface developed by Huawei Technologies Co. Ltd. and is based on Google's Android Open Source Project (AOSP). EMUI is preinstalled on most Huawei and Honor devices. While it was based on open source Android operating system, it consists of closed source and proprietary software. /e/ is an operating system forked from the source code of LineageOS (based on Android). It supports currently 76 devices as of April 2019. /e/ targets Android smart phone devices, and uses MicroG as a replacement for Google Play Services. Flyme OS is an operating system developed by Meizu Technology Co., Ltd., an open source OS based on Google Android Open Source Project (AOSP). Flyme OS is mainly installed on Meizu Smartphones such as the MX's series; however, it also has official ROM support for a few Android devices. Funtouch OS is a fork of an Android developed by Vivo. Funtouch OS is difference than traditional Android UI that the Funtouch OS includes some features unavailable in the former, such as:- customizable gestures, communication drawer with bottom to top swipe, a security centre, lock screen resize, options for long screen shot, eye protection changing to a warmer color temperature and others. Funtouch OS, in some respects, looks similar to iOS made by Apple. HTC Sense is a software suite developed by HTC, used primarily on the company's Android-based devices. Serving as a successor to HTC's TouchFLO 3D software for Windows Mobile, Sense modifies many aspects of the Android user experience, incorporating added features (such as an altered home screen and keyboard), widgets, HTC-developed applications, and redesigned applications. The first device with Sense, the HTC Hero, was released in 2009. Indus OS is a custom mobile operating system based on the Android Open Source Project (AOSP). It is developed by the Indus OS team based in India. No longer valid as of 2018Indus OS is available on Micromax, Intex, Karbonn, and other Indian smartphone brands. LG UX (formerly named Optimus UI) is a front-end touch interface developed by LG Electronics with partners, featuring a full touch user interface. It is sometimes incorrectly identified as an operating system. LG UX is used internally by LG for sophisticated feature phones and tablet computers, and is not available for licensing by external parties. Optimus UI 2 which based on Android 4.1.2 has been released on the Optimus K II and the Optimus Neo 3. It features a more refined user interface compared to the prior version based on Android 4.1.1, would include together which new functionality such as voice shutter and quick memo. Lineage Android Distribution is a custom mobile operating system based on the Android Open Source Project (AOSP). It serves as the successor to the highly popular custom ROM, CyanogenMod, from which it was forked in December 2016 when Cyanogen Inc. announced it was discontinuing development and shut down the infrastructure behind the project. Since Cyanogen Inc. retained the rights to the Cyanogen name, the project rebranded its fork as LineageOS. Similar to CyanogenMod, it does not include any proprietary apps unless the user installs them. It allows Android users who can no longer obtain update support from their manufacturer to continue updating their OS version to the latest one based on official release from Google AOSP and heavy theme customization. MiFavor, was the custom Android UI that was developed by ZTE for their smartphone that is running Android platform. Similar to most of the other Android UI, MiFavor replace most of the stock apps with ZTE owns apps, however the all UX still closely similar to the stock Android. Mi User Interface (MIUI), developed by the Chinese electronic company Xiaomi Inc., is a mobile operating system based on the Android Open Source Project (AOSP). MIUI is mostly found in Xiaomi smartphones such as the Mi and Redmi Series; however, it also has official ROM support for few Android devices. Although MIUI is based on AOSP, which is open source, it consists of closed source and proprietary software of its own. MIUI 7 – based on Android "KitKat" 4.4, "Lollipop" 5.x and "Marshmallow" 6.x. MIUI 8 – based on Android "KitKat" 4.4, "Lollipop" 5.x and "Marshmallow" 6.x. MIUI for POCO is a custom mobile operating system that is based on MIUI, which itself was based on Android "Open Source Project (AOSP)". Just like it predecessor, it also develop by Xiaomi Inc. Unlike the original MIUI, MIUI for POCO was specifically customized for their Poco series smartphone, including difference UI and more frequent update compare to the original MIUI. Just like MIUI which is based on open source AOSP, MIUI for POCO also consists of closed source and proprietary software of its own. OxygenOS is based on the open source Android Open Source Project (AOSP) and is developed by OnePlus to replace Cyanogen OS on OnePlus devices such as the OnePlus One, and it is preinstalled on the OnePlus 2, OnePlus X, OnePlus 3, OnePlus 3T, OnePlus 5, OnePlus 5T and OnePlus 6. As stated by Oneplus, OxygenOS is focused on stabilizing and maintaining of stock like those found on Nexus devices. It consists of mainly Google apps and minor UI customization to maintain the sleekness of pure Android. Pixel UI is developed by Google that is based on open source Android. Unlike the Nexus phones, where Google shipped with the "stock" Android, the UI that came with the first generation Pixel phones were slightly modified as compared to the "stock" Android. As part of the Google Pixel software, the Pixel UI and its home launcher are closed source and proprietary, thus it is only available on the Pixel family devices. (However, third party mods allow non Pixel smartphones to install Pixel Launcher with Google Now feed integration). Replicant is a custom mobile operating system based on the Android with all proprietary drivers and bloat closed source software removed. Samsung Experience (formerly called TouchWiz) is a front-end touch interface developed by Samsung Electronics with partners, featuring a full touch user interface. It is sometimes incorrectly identified as an independent operating system. Samsung Experience is used internally by Samsung for smartphones, feature phones and tablet computers, and is not available for licensing by external parties as it is closed source and proprietary. The Android version of Samsung Experience also comes with Samsung-made apps preloaded (except starting with the Galaxy S6 which have removed all Samsung pre-loaded apps installed, leaving one with Galaxy Apps, to save storage space and initially due to the removal of MicroSD). With the release of Samsung Galaxy S8 and S8+, Samsung Experience 8.1 was preinstall on it with introducing new function known as Samsung DeX. Similar to the concept of Microsoft Continuum, Samsung DeX allowed high end Galaxy devices such as S8/S8+ or Note 8 to connect into a docking station, which extends the functionality to allow desktop-like functionality by connecting a keyboard, mouse, and monitor. Samsung also announced "Linux on Galaxy", which allows to use the standard Linux distribution on the DeX platform. Sony Xperia UI, (formerly known as Timescape UI), was the front-end UI that developed by Sony Mobile (formerly Sony Ericsson) for their Sony Xperia series that is running Android platform. Sony Xperia UI mostly consists of Sony own's application such as Sony Music (formerly known as Walkman Music player), Albums and Video Player. During its time as Timescape UI, the UI was different than the standard Android UI, instead of traditional apps dock on the bottom part, it was located at the four corner of the home screen, while the middle of the screen consist of the widget. However the recent development of UI are closely resemble to those of Stock Android. ZenUI is a front-end touch interface developed by ASUS with partners, featuring a full touch user interface. ZenUI is used by Asus for its Android phones and tablet computers, and is not available for licensing by external parties. ZenUI also comes preloaded with Asus-made apps like ZenLink (PC Link, Share Link, Party Link & Remote Link). Chrome OS is an operating system designed by Google that is based on the Linux kernel and uses the Google Chrome web browser as its principal user interface. As a result, Chrome OS primarily supports web applications. Google announced the project in July 2009, conceiving it as an operating system in which both applications and user data reside in the cloud: hence Chrome OS primarily runs web applications. Due to increase of popularity with 2 in 1 PCs, most recent Chromebooks are introduced with touch screen capability, with Android applications starting to become available for the operating system in 2014. And in 2016, access to Android apps in the entire Google Play Store was introduced on supported Chrome OS devices. With the support of Android applications, there are Chromebook devices that are positioned as tablet based instead of notebooks. Chrome OS is only available pre-installed on hardware from Google manufacturing partners. An open source equivalent, Chromium OS, can be compiled from downloaded source code. Early on, Google provided design goals for Chrome OS, but has not otherwise released a technical description. Fuchsia is a capability-based, real-time operating system (RTOS) currently being developed by Google. It was first discovered as a mysterious code post on GitHub in August 2016, without any official announcement. In contrast to prior Google-developed operating systems such as Chrome OS and Android, which are based on Linux kernels, Fuchsia is based on a new microkernel called "Zircon", derived from "Little Kernel", a small operating system intended for embedded systems. Upon inspection, media outlets noted that the code post on GitHub suggested Fuchsia's capability to run on universal devices, from embedded systems to smartphones, tablets and personal computers. In May 2017, Fuchsia was updated with a user interface, along with a developer writing that the project was not a for experimental, prompting media speculation about Google's intentions with the operating system, including the possibility of it replacing Android. LiteOS is a lightweight open source real-time operating system which is part of Huawei's "1+2+1" Internet of Things solution, which is similar to Google Android Things and Samsung Tizen. Huawei LiteOS features lightweight, low-power, fast-response, multi-sensor collaboration, multi-protocol interconnect connectivity, enabling IoT terminals to quickly access the network. Huawei LiteOS will make intelligent hardware development easier. Thereby accelerating the realization of the interconnection of all things. Currently LiteOS are introduce to the consumer market with the Huawei Watch GT series and smartbands. PureOS is a Debian GNU/Linux derivative using only free software, developed by Purism (company), already used on Purism's laptops and planned for use on the Librem 5 smartphone. Purism, in partnership with GNOME and KDE, aims to separate the CPU from the baseband processor and include hardware kill switches for the phone's Wi-Fi, Bluetooth, camera, microphone and baseband processor, and provide both GNOME and KDE Plasma Mobile as options for the desktop environment. Sailfish OS is from Jolla. It is open source with GNU General Public License (GPL) for middleware stack core which comes from MER. Sailfish due to Jolla's business model and due to alliances with various partners and due to intentional design of OS internals, is capable to adopt in several layers third party software including Jolla software e.g. Jolla's UI is proprietary software (closed source), so such components can be proprietary with many different kinds of licences. However, user can replace them with open source components like e.g. NEMO UI instead Jolla's UI. Using third party software extends usability but does not make the OS code close, in the same way as preinstalled Microsoft Word (closed source) on a Linux device does not make Linux closed source. After Nokia abandoned in 2011 the MeeGo project, most of the MeeGo team left Nokia, and established Jolla as a company to use MeeGo and Mer business opportunities. The MER standard allows it to be launched on any hardware with kernel compatible with MER. In 2012, Linux Sailfish OS based on MeeGo and using middleware of MER core stack distribution was launched for public use. The first device, the Jolla smartphone, was unveiled on May 20, 2013. In 2015, Jolla Tablet was launched and the BRICS countries declared it an officially supported OS there. Jolla started licensing Sailfish OS 2.0 for third parties. Some devices sold are updateable to Sailfish 2.0 with no limits. Tizen (based on the Linux kernel) is a mobile operating system hosted by Linux Foundation, together with support from the Tizen Association, guided by a Technical Steering Group composed of Intel and Samsung. Tizen is an operating system for devices including smartphones, tablets, In-Vehicle Infotainment (IVI) devices, and smart TVs. It is an open source system (however the SDK was closed source and proprietary) that aims to offer a consistent user experience across devices. Tizen's main components are the Linux kernel and the WebKit runtime. According to Intel, Tizen "combines the best of LiMo and MeeGo." HTML5 apps are emphasized, with MeeGo encouraging its members to transition to Tizen, stating that the "future belongs to HTML5-based applications, outside of a relatively small percentage of apps, and we are firmly convinced that our investment needs to shift toward HTML5." Tizen will be targeted at a variety of platforms such as handsets, touch pc, smart TVs and in-vehicle entertainment. On May 17, 2013, Tizen released version 2.1, code-named Nectarine. While Tizen itself was open source, most of the UX and UI layer that developed by Samsung was mainly closed source and proprietary, such as the TouchWiz UI on the Samsung Z's series smartphone. Ubuntu Touch is from Canonical Ltd.. It is open source and uses the GPL license. Ubuntu Touch as an OS is built using the Android Linux kernel, using Android drivers and services via an LXC container, but does not use any of the Java-like code of Android. As of August 2018[update], the desktop environment of Ubuntu Touch is planned to be available as one of the default desktop options on the Librem 5 running PureOS as the operating system. Though Canonical formally announced it was discontinuing the Ubuntu mobile OS with its integral component Unity8, the independent German non-profit UBPorts Community/("Foundation" paperwork pending in the local Berlin-government) decided to takeover the project. Canonical started Ubuntu Touch based on Ubuntu 15.04 (Vivid Vervet) and UBPorts upgraded the base to the nearest, current long-term support version Ubuntu 16.04 LTS (Xenial Xerus). Plasma Mobile is a KDE desktop environment for mobile phones intended to be compatible with several different mobile phone operating systems, including PureOS running on the Librem 5. Other open source mobile operating systems under active development as of 2018[update] include LuneOS, based on webOS; postmarketOS, based on the Alpine Linux GNU/Linux distribution; Maemo Leste; Meizu PRO 5 Ubuntu Edition and Meizu MX4 Ubuntu Edition running Ubuntu Touch; and Necuno using a GNU/Linux distribution and the Plasma Mobile desktop from KDE. The proprietary version of Amazfit OS that are develop by Xiaomi backed Huami for their Amazfit Bip smartwatch, however instead of based on Android, it was based on proprietary operating system, thus it is not able to install third party apps such as APK's. iOS (formerly named iPhone OS) was created by Apple Inc. It has the second largest installed base worldwide on smartphones, but the largest profits, due to aggressive price competition between Android-based manufacturers. It is closed source and proprietary, and is built on the open source Darwin operating system. The iPhone, iPod Touch, iPad and second or third-generation Apple TV all use iOS, which is derived from macOS. Native third party applications were not officially supported until the release of iPhone OS 2.0 on July 11, 2008. Before this, "jailbreaking" allowed third party applications to be installed, and this method is still available. Currently all iOS devices are developed by Apple and manufactured by Foxconn or another of Apple's partners. Windows 10 is a personal computer operating system developed and released by Microsoft as part of the Windows NT family of operating systems. It was released on July 29, 2015. Just like its predecessors, it was designed to run across multiple Microsoft product such as PCs and Tablets. The Windows user interface was revised to handle transitions between a mouse-oriented interface and a touchscreen-optimized interface based on available input devices‍—‌particularly on 2-in-1 PCs. Windows 10 also introduces the universal apps, expanding on Metro-style apps, these apps can be designed to run across multiple Microsoft product families with nearly identical code‍—‌including PCs, tablets, smartphones, embedded systems, Xbox One, Surface Hub and Mixed Reality. KaiOS is from Kai. It is based on Firefox OS. Unlike most mobile operating systems which focus on smartphones, KaiOS was developed mainly for feature phones, giving these access to more advanced technologies usually found on smartphones, such as app stores and Wi-Fi/4G capabilities. BlackBerry 10 (based on the QNX OS) is from BlackBerry. As a smartphone OS, it is closed source and proprietary, and only runs on phones and tablets manufactured by BlackBerry. One of the dominant platforms in the world in late 2000s, its global market share was reduced significantly by mid-2010s. In late 2016, BlackBerry announced that it will continue to support the OS, with a promise to release 10.3.3. Therefore, BlackBerry 10 would not receive any major updates as BlackBerry and its partners would focus more on their Android base development. Windows 10 Mobile (formerly called Windows Phone) is from Microsoft. It is closed source and proprietary. Unveiled on February 15, 2010, Windows Phone includes a user interface inspired by Microsoft's Metro Design Language. It is integrated with Microsoft services such as OneDrive and Office, Xbox Music, Xbox Video, Xbox Live games and Bing, but also integrates with many other non-Microsoft services such as Facebook and Google accounts. Windows Phone devices were made primarily by Microsoft Mobile/Nokia, and also by HTC and Samsung. On January 21, 2015, Microsoft announced that the Windows Phone brand will be phased out and replaced with Windows 10 Mobile, bringing tighter integration and unification with its PC counterpart Windows 10, and provide a platform for smartphones and tablets with screen sizes under 8 inches. In October 2017, Microsoft officially announced that they would no longer push any major updates to Windows 10 Mobile, instead it would put it in maintenance mode, where Microsoft would push bug fixes and general improvements only, therefore Windows 10 Mobile would not receive any new feature updates. On December 24, 2016, CyanogenMod announced on their blog that they would no longer be releasing any CyanogenMod updates. All development moved to LineageOS. Cyanogen OS was based on CyanogenMod and maintained by Cyanogen Inc; however, it included proprietary apps and it was only available for commercial uses. Firefox OS (project name: Boot to Gecko, also known as B2G) is from Mozilla. It was an open source mobile operating system released under the Mozilla Public License built on the Android Linux kernel and used Android drivers, but did not use any Java-like code of Android. According to Ars Technica, "Mozilla says that B2G is motivated by a desire to demonstrate that the standards-based open Web has the potential to be a competitive alternative to the existing single-vendor application development stacks offered by the dominant mobile operating systems." In September 2016, Mozilla announced that work on Firefox OS has ceased, and all B2G-related code would be removed from mozilla-central. MeeGo was from non-profit organization The Linux Foundation. It is open source and GPL. At the 2010 Mobile World Congress in Barcelona, Nokia and Intel both unveiled MeeGo, a mobile operating system that combined Moblin and Maemo to create an open-sourced experience for users across all devices. In 2011 Nokia announced that it would no longer pursue MeeGo in favor of Windows Phone. Nokia announced the Nokia N9 on June 21, 2011 at the Nokia Connection event in Singapore. LG announced its support for the platform. Maemo was a platform developed by Nokia for smartphones and Internet tablets. It is open source and GPL, based on Debian GNU/Linux and draws much of its graphical user interface (GUI), frameworks, and libraries from the GNOME project. It uses the Matchbox window manager and the GTK-based Hildon as its GUI and application framework. webOS was developed by Palm. webOS is an open source mobile operating system running on the Linux kernel, initially developed by Palm, which launched with the Palm Pre. After being acquired by HP, two phones (the Veer and the Pre 3) and a tablet (the TouchPad) running webOS were introduced in 2011. On August 18, 2011, HP announced that webOS hardware would be discontinued, but would continue to support and update webOS software and develop the webOS ecosystem. HP released webOS as open source under the name Open webOS, and plans to update it with additional features. On February 25, 2013 HP announced the sale of WebOS to LG Electronics, who used the operating system for its "smart" or Internet-connected TVs. However, HP retained patents underlying WebOS and cloud-based services such as the App Catalog. In 1999, Research In Motion released its first BlackBerry devices, providing secure real-time push-email communications on wireless devices. Services such as BlackBerry Messenger provide the integration of all communications into a single inbox. In September 2012, RIM announced that the 200 millionth BlackBerry smartphone was shipped. As of September 2014, there were around 46 million active BlackBerry service subscribers. In early 2010s, RIM has undergone a platform transition, changing its company name to BlackBerry Limited and making new devices on a new platform named "BlackBerry 10". Windows Mobile is a discontinued operating system from Microsoft that it replaced with Windows Phone. It is closed source and proprietary. The Windows CE operating system and Windows Mobile middleware was widely spread in Asia (which mostly uses Android now). The two improved variants of this operating system, Windows Mobile 6 Professional (for touch screen devices) and Windows Mobile 6 Standard, were unveiled in February 2007. It was criticized for having a user interface which is not optimized for touch input by fingers; instead, it is more usable with a stylus. Like iOS, and most other Mobile OS, it supports both touch screen, physical and Bluetooth keyboard configurations. Microsoft phased out the Windows Mobile OS to focus on Windows Phone. Windows Phone is a family of mobile operating systems developed by Microsoft for smartphones as the replacement successor to Windows Mobile and Zune. Windows Phone features a new user interface derived from Metro design language. Windows Phone was replaced by Windows 10 Mobile in 2015. The Symbian platform was developed by Nokia for some models of smartphones. It is proprietary software, it was however used by Ericsson (SonyEricsson), Sending and Benq. The operating system was discontinued in 2012, although a slimmed-down version for basic phones was still developed until July 2014. Microsoft officially shelved the platform in favor of Windows Phone after its acquisition of Nokia. Bada platform (stylized as bada; Korean: 바다) was an operating system for mobile devices such as smartphones and tablet computers. It was developed by Samsung Electronics. Its name is derived from "바다 (bada)", meaning "ocean" or "sea" in Korean. It ranges from mid- to high-end smartphones. To foster adoption of Bada OS, since 2011 Samsung reportedly has considered releasing the source code under an open-source license, and expanding device support to include Smart TVs. Samsung announced in June 2012 intentions to merge Bada into the Tizen project, but would meanwhile use its own Bada operating system, in parallel with Google Android OS and Microsoft Windows Phone, for its smartphones. All Bada-powered devices are branded under the Wave name, but not all of Samsung's Android-powered devices are branded under the name Galaxy. On February 25, 2013, Samsung announced that it will stop developing Bada, moving development to Tizen instead. Bug reporting was finally terminated in April 2014. Palm OS/Garnet OS was from Access Co. It is closed source and proprietary. webOS was introduced by Palm in January 2009, as the successor to Palm OS with Web 2.0 technologies, open architecture and multitasking abilities. In 2006, Android and iOS did not exist and only 64 million smartphones were sold. In 2018 Q1, 383.5 million smartphones were sold and global market share was 85.9% for Android and 14.1% for iOS. According to StatCounter web use statistics (a proxy for all use), smartphones (alone without tablets) have majority use globally, with desktop computers used much less (and Android in particular more popular than Windows). Use varies however by continent with smartphones way more popular in the biggest continents, i.e. Asia, and the desktop still more popular in some, though not in North America. The desktop is still popular in many countries (while overall down to 44.9% in the first quarter of 2017), smartphones are more popular even in many developed countries (or about to be in more). A few countries on any continent are desktop-minority; European countries (and some in South America, and a few, e.g. Haiti, in North America; and most in Asia and Africa) are smartphone-majority, Poland and Turkey highest with 57.68% and 62.33%, respectively. In Ireland, smartphone use at 45.55% outnumbers desktop use and mobile as a whole gains majority when including the tablet share at 9.12%. Spain is also slightly desktop-minority. The range of measured mobile web use varies a lot by country, and a StatCounter press release recognizes "India amongst world leaders in use of mobile to surf the internet" (of the big countries) where the share is around (or over) 80% and desktop is at 19.56%, with Russia trailing with 17.8% mobile use (and desktop the rest). Smartphones (alone, without tablets), first gained majority in December 2016 (desktop-majority was lost the month before), and it wasn't a Christmas-time fluke, as while close to majority after smartphone majority happened again in March 2017. In the week from November 7–13, 2016, smartphones alone (without tablets) overtook desktop, for the first time (for a short period; non-full-month). Mobile-majority applies to countries such as Paraguay in South America, Poland in Europe and Turkey; and most of Asia and Africa. Some of the world is still desktop-majority, with e.g. in the United States at 54.89% (but no not on all days). However, in some territories of the United States, such as Puerto Rico, desktop is way under majority, with Windows under 30% overtaken by Android. On October 22, 2016 (and subsequent weekends), mobile showed majority. Since October 27, the desktop hasn't shown majority, not even on weekdays. And smartphones alone have showed majority since December 23 to the end of the year, with the share topping at 58.22% on Christmas Day. To the "mobile"-majority share then of smartphones, tablets could be added giving a 63.22% majority. While an unusually high top, a similarly high also happened on Monday April 17, 2017, with then only smartphones share slightly lower and tablet share slightly higher, with them combined at 62.88%. Formerly, according to StatCounter press release, the world has turned desktop-minority; as of October 2016[update], at about 49% desktop use for that month, but mobile wasn't ranked higher, tablet share had to be added to it to exceed desktop share. Other includes all other smartphone OSes but not feature phone OSes. See table below for source data. ^ "Gartner Says Worldwide Sales of Smartphones Returned to Growth in First Quarter of 2018". Gartner, Inc. Gartner. May 29, 2018. Retrieved August 29, 2018. ^ Jobs, Steve (19 January 2007). Macworld San Francisco 2007 Keynote Address. San Francisco: Apple, Inc. Archived from the original on 23 January 2007. ^ Delft, Miguel (5 November 2007). "Google Enters the Wireless World". New York Times. Archived from the original on 10 November 2012. Retrieved 7 September 2011. ^ "Ubuntu phone OS announced, first devices shipping in early 2014". Archived from the original on 20 June 2017. ^ The Associated Press (22 August 2016). "Google Rolling Out Latest Android System to Nexus Phones". The New York Times. ISSN 0362-4331. Archived from the original on 26 August 2016. Retrieved 29 August 2016. ^ a b "Gartner Says Worldwide Mobile Phone Sales Grew 35 Percent in Third Quarter 2010; Smartphone Sales Increased 96 Percent". Gartner, Inc. 10 November 2010. Table 2. Archived from the original on 13 January 2011. Retrieved 21 February 2011. ^ "ICS is coming to AOSP". ^ Balky carriers and slow OEMs step aside: Google is defragging Android. Archived September 3, 2013, at the Wayback Machine Ars Technica Archived July 3, 2017, at the Wayback Machine. Retrieved December 24, 2013. ^ "<uses-sdk> | Android Developers". Android Developers. Retrieved April 28, 2018. ^ "Android 7.0 for Developers | Android Developers". developer.android.com. Archived from the original on 11 September 2016. Retrieved 9 September 2016. ^ "Android 7.1 for Developers | Android Developers". developer.android.com. Archived from the original on 7 March 2017. Retrieved 6 March 2017. ^ "Distribution dashboard | Android Developers". Android Developers. Retrieved April 28, 2018. ^ "OnePlus 3". oneplus.net. Archived from the original on 21 September 2016. Retrieved 9 September 2016. ^ "Kernel Design". The Chromium Projects. ^ Byfield, Bruce (2018). "Librem 5 and the Challenge of the Free Phone". Linux Magazine. Archived from the original on August 28, 2018. Retrieved August 29, 2018. ^ Holwerda, Thom (August 24, 2017). "Librem 5: a security and privacy focused GNU/Linux smartphone". OSNews. Archived from the original on August 28, 2018. Retrieved August 29, 2018. ^ Welcome to Tizen! Archived October 13, 2011, at the Wayback Machine. Tizen.org (September 27, 2011). Retrieved on 2012-07-03. ^ Ricker, Thomas. (September 28, 2011)MeeGo is dead: Meet Tizen, another new open source OS based on Linux Archived September 30, 2011, at the Wayback Machine. Thisismynext.com. Retrieved on 2012-07-03. ^ a b "Tizen 2.1 SDK and Source Code Release". Tizen.org. Archived from the original on 30 July 2013. ^ "ContainerArchitecture". Archived from the original on 31 October 2016. Retrieved 30 October 2016. ^ a b Verma, Ardash (April 25, 2018). "Open Source Smartphone Librem 5 Will Officially Support Ubuntu Touch". Fossbytes. Archived from the original on August 28, 2018. Retrieved August 29, 2018. ^ "Growing Ubuntu for cloud and IoT, rather than phone and convergence". April 5, 2017. Retrieved September 27, 2018. ^ "Is Ubuntu Touch Dead?". January 5, 2017. Retrieved September 27, 2018. ^ "The UBports Foundation *: Details about the foundation". June 19, 2018. Retrieved September 27, 2018. ^ "Touch/ReleaseNotes". February 7, 2017. Retrieved September 27, 2018. ^ "Milestones". September 24, 2018. Retrieved September 27, 2018. ^ "Stable OTA-1. Halium is Heating up, Convergence Works!". June 18, 2017. Retrieved September 27, 2018. ^ "Ubuntu Touch OTA-2 Release". September 5, 2017. Retrieved September 27, 2018. ^ "Ubuntu Touch OTA-3". December 22, 2017. Retrieved September 27, 2018. ^ "Ubuntu Touch OTA-4 Release". August 26, 2018. Retrieved September 27, 2018. ^ "Ubuntu Touch OTA-5 Release". October 12, 2018. Retrieved December 19, 2018. ^ "Ubuntu Touch OTA-6 Release". December 7, 2018. Retrieved December 19, 2018. ^ Tung, Liam (November 30, 2018). "First truly open-source smartphone? Necuno unveils its KDE on Linux handset". ZDNet. Archived from the original on March 7, 2019. Retrieved March 7, 2019. ^ Lunden, Ingrid. "Apple Took 89% Of Q4 Smartphone Profits With Android OEMs In A Race To The Bottom". Archived from the original on 15 July 2017. ^ "The emerging OS". KaiOS. Retrieved March 27, 2019. ^ 4, Patrick O'RourkeJan; comments, 201711:25 AM EST41 (4 January 2017). "BlackBerry has no plans to release new BB10 devices [Update]". Archived from the original on 5 January 2017. ^ "Android and iOS Squeeze the Competition, Swelling to 96.3% of the Smartphone Operating System Market for Both 4Q14 and CY14, According to IDC". IDC.com. 24 February 2015. Archived from the original on 25 February 2015. ^ Hruska, Joel (October 9, 2017). "Microsoft Admits Windows 10 Mobile Is Finally, Mercifully Dead". www.extremetech.com. Retrieved April 3, 2018. ^ CM14 is discontinued, along with the CM project being shut down. Development moved to LineageOS. ^ "MOD ready Cyanogen OS 13.1 is now available for the OnePlus One". Android Authority. Archived from the original on 16 August 2016. Retrieved 9 September 2016. ^ "B2G – MozillaWiki". mozilla.org. 24 August 2011. Archived from the original on 7 August 2011. Retrieved 7 September 2011. ^ Paul, Ryan (25 July 2011). "Mozilla eyes mobile OS landscape with new Boot to Gecko project". Arstechnica.com. Archived from the original on 12 September 2011. Retrieved 7 September 2011. ^ "B2G OS and Gecko Announcement from Ari Jaaksi & David Bryant". 27 September 2016. Archived from the original on 22 January 2011. Retrieved 27 September 2016. ^ "Introducing the Nokia N9: all it takes is a swipe! | Nokia Conversations – The official Nokia Blog". Nokia. June 21, 2011. Retrieved September 7, 2011. ^ "MeeGo Not Dead Yet as LG Continues the Charge — Mobile Technology News". Gigaom.com. 29 April 2011. Archived from the original on 29 August 2011. Retrieved 7 September 2011. ^ "HP Confirms Discussions with Autonomy Corporation plc Regarding Possible Business Combination; Makes Other Announcements". HP. 18 August 2010. Archived from the original on 6 October 2011. Retrieved 13 September 2011. ^ "The next chapter for webOS". HP webOS Developer Blog. 19 August 2010. Archived from the original on 24 September 2011. Retrieved 13 September 2011. ^ "Open webOS::Roadmap". Open webOS Project. September 2012. Archived from the original on 29 October 2012. Retrieved 24 October 2012. ^ Arthur, Charles (29 September 2014). "Ten things to know about BlackBerry – and how much trouble it is (or isn't) in". TheGuardian.com. The Guardian. Archived from the original on 28 May 2015. Retrieved 19 April 2015. ^ Kevin McLaughlin (17 December 2009). "BlackBerry Users Call For RIM To Rethink Service". CRN.com. Archived from the original on 7 September 2011. Retrieved 15 December 2011. ^ "CEO Ballmer Reportedly Says Microsoft 'Screwed Up' with Windows Mobile". eWeek. September 28, 2009. ^ "iPhone drops to 24% smartphone share, Android jumps to 17%". AppleInsider. 16 September 2010. Archived from the original on 26 August 2011. Retrieved 7 September 2011. ^ "Windows Phone developers". Yeeply Windows Phone. Archived from the original on 19 February 2015. ^ "Microsoft is killing off Nokia's feature phones in favor of Windows Phone". 17 July 2014. Archived from the original on 8 August 2017. ^ Samsung scraps Bada OS, folds it into Tizen – FierceMobileIT Archived February 28, 2013, at the Wayback Machine. Fiercemobilecontent.com (February 25, 2013). Retrieved on 2013-12-09. ^ "64 million smart phones shipped worldwide in 2006". Canalys, Inc. Archived from the original on 6 January 2012. Retrieved 13 January 2012. ^ "Gartner Says Worldwide Sales of Smartphones Returned to Growth in First Quarter of 2018". Gartner, Inc. Gartner. May 29, 2018. Retrieved August 25, 2018. ^ "Desktop vs Mobile vs Tablet vs Console Market Share Worldwide | StatCounter Global Stats". StatCounter Global Stats. Retrieved October 20, 2017. ^ "India amongst world leaders in use of mobile to surf the internet" (Press release). 28 March 2017. Archived from the original on 22 April 2017. ^ "Comparison from W34 to W45 2015". StatCounter Global Stats. Archived from the original on 20 April 2017. ^ "StatCounter Global Stats – Browser, OS, Search Engine including Mobile Usage Share". Archived from the original on 26 May 2012. ^ "StatCounter Global Stats – Browser, OS, Search Engine including Mobile Usage Share". statcounter.com. Archived from the original on 26 May 2012. Retrieved 22 March 2017. ^ "Mobile and tablet Internet usage exceeds desktop for first time worldwide". StatCounter (Press release). Archived from the original on 1 November 2016. ^ "Gartner Says Demand for 4G Smartphones in Emerging Markets Spurred Growth in Second Quarter of 2017". www.gartner.com. Archived from the original on 1 September 2017. Retrieved 31 August 2017. ^ "Gartner Says Worldwide Sales of Smartphones Grew 9 Percent in First Quarter of 2017". www.gartner.com. Archived from the original on 6 June 2017. Retrieved 26 May 2017. ^ "Gartner Says Worldwide Sales of Smartphones Grew 7 Percent in the Fourth Quarter of 2016". www.gartner.com. Archived from the original on 18 February 2017. Retrieved 27 March 2017. ^ "Gartner Says Chinese Smartphone Vendors Were Only Vendors in the Global Top Five to Increase Sales in the Third Quarter of 2016". www.gartner.com. Archived from the original on 20 November 2016. Retrieved 9 December 2016. ^ "Gartner Says Five of Top 10 Worldwide Mobile Phone Vendors Increased Sales in Second Quarter of 2016". www.gartner.com. Archived from the original on 19 August 2016. Retrieved 19 August 2016. ^ "Gartner Says Worldwide Smartphone Sales Grew 3.9 Percent in First Quarter of 2016". www.gartner.com. Archived from the original on 22 May 2016. Retrieved 26 May 2016. ^ "Gartner Smart Phone Marketshare 2015 Q4". Gartner, Inc. Archived from the original on 13 June 2017. Retrieved 19 November 2015. ^ "Gartner Smart Phone Marketshare 2015 Q3". Gartner, Inc. Archived from the original on 20 November 2015. Retrieved 19 November 2015. ^ a b "Gartner Smart Phone Marketshare 2015 Q2". Gartner, Inc. Archived from the original on 22 August 2015. Retrieved 21 August 2015. ^ a b "Gartner Smart Phone Marketshare 2015 Q1". Gartner, Inc. Archived from the original on 14 June 2015. Retrieved 9 June 2015. ^ "Gartner Smart Phone Marketshare 2014 Q4". Gartner, Inc. Archived from the original on 13 June 2017. Retrieved 15 December 2014. ^ "Gartner Smart Phone Marketshare 2014 Q3". Gartner, Inc. Archived from the original on 15 December 2014. Retrieved 15 December 2014. ^ "Gartner Smart Phone Marketshare 2013 Q4". Gartner, Inc. Archived from the original on 14 February 2014. Retrieved 13 January 2014. ^ "Gartner Smart Phone Marketshare 2013 Q3". Gartner, Inc. Archived from the original on 14 November 2013. Retrieved 14 November 2013. ^ "Gartner Smart Phone Marketshare 2013 Q2". Gartner, Inc. Archived from the original on 16 August 2013. Retrieved 14 August 2013. ^ "Gartner Smart Phone Marketshare 2013 Q1". Gartner, Inc. Archived from the original on 7 June 2013. Retrieved 14 May 2013. ^ "Gartner Smart Phone Marketshare 2012 Q4". Gartner, Inc. Archived from the original on 28 December 2015. Retrieved 13 February 2013. ^ "Gartner Smart Phone Marketshare 2012 Q3". Gartner, Inc. Archived from the original on 15 November 2012. Retrieved 14 November 2012. ^ "Gartner Smart Phone Marketshare 2012 Q2". Gartner, Inc. Archived from the original on 16 August 2012. Retrieved 14 August 2012. ^ "Gartner Smart Phone Marketshare 2012 Q1". Gartner, Inc. Archived from the original on 28 May 2012. Retrieved 26 May 2012. ^ a b "Gartner Smart Phone Marketshare 2011 Q4". Gartner, Inc. Archived from the original on 19 May 2012. Retrieved 26 May 2012. ^ a b "Gartner Smart Phone Marketshare 2011 Q3". Gartner, Inc. Archived from the original on 16 May 2012. Retrieved 26 May 2012. ^ a b "Gartner Smart Phone Marketshare 2011 Q2". Gartner, Inc. Archived from the original on 3 June 2012. Retrieved 26 May 2012. 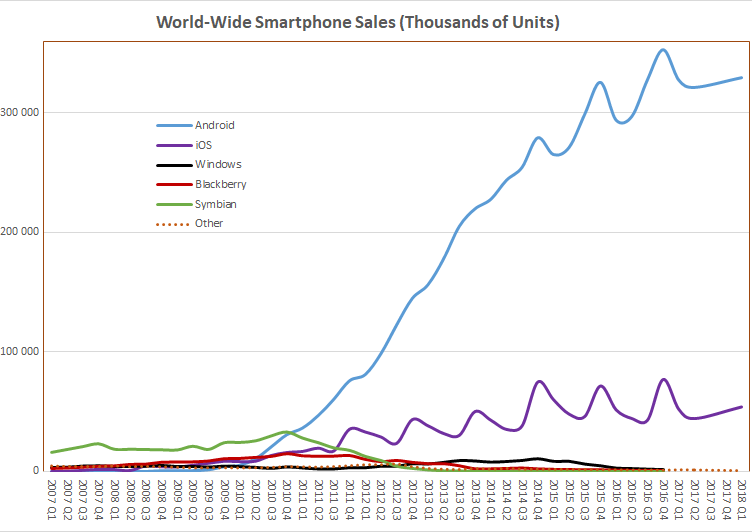 ^ a b "Gartner Smart Phone Marketshare 2011 Q1". Gartner, Inc. Archived from the original on 10 May 2012. Retrieved 26 May 2012. ^ "Gartner Smart Phone Marketshare 2010 Q4". Gartner, Inc. Archived from the original on 6 June 2012. Retrieved 26 May 2012. ^ "Gartner Smart Phone Marketshare 2010 Q3". Gartner, Inc. Archived from the original on 10 May 2012. Retrieved 26 May 2012. ^ "Gartner Smart Phone Marketshare 2010 Q2". Gartner, Inc. Archived from the original on 24 May 2012. Retrieved 26 May 2012. ^ "Gartner Smart Phone Marketshare 2010 Q1". Gartner, Inc. Archived from the original on 10 May 2012. Retrieved 26 May 2012. ^ a b c d "Gartner Smart Phone Marketshare 2008 Q4". Gartner, Inc. Archived from the original on 24 May 2012. Retrieved 26 May 2012. ^ a b "Gartner Smart Phone Marketshare 2008 Q3". Gartner, Inc. Archived from the original on 24 May 2012. Retrieved 26 May 2012. ^ a b "Gartner Smart Phone Marketshare 2008 Q2". Gartner, Inc. Archived from the original on 20 May 2012. Retrieved 26 May 2012. ^ a b "Smartphone OS Market Share, 2017 Q1". idc.com. May 2017. Retrieved 28 January 2018. ^ a b c d "Smartphone OS Market Share, 2016 Q3". idc.com. 1 November 2016. Archived from the original on 16 March 2017. Retrieved 17 March 2017. ^ "Smartphone OS Market Share, Q2 2015". idc.com. 29 October 2015. Archived from the original on 30 October 2015. Retrieved 29 October 2015. ^ "Smartphone OS Market Share, Q1 2015". idc.com. 25 August 2015. Archived from the original on 23 August 2015. Retrieved 25 August 2015. ^ "Smartphone OS Market Share, Q4 2014". idc.com. 24 February 2015. Archived from the original on 25 February 2015. Retrieved 27 February 2015. ^ "Smartphone OS Market Share, Q3 2014". idc.com. 21 December 2014. Archived from the original on 17 December 2014. Retrieved 21 December 2014. ^ "Smartphone OS Market Share, Q2 2014". idc.com. 14 August 2014. Archived from the original on 17 August 2014. Retrieved 14 August 2014. ^ "Smartphone OS Market Share, Q1 2014". idc.com. 29 June 2014. Archived from the original on 1 July 2014. Retrieved 29 June 2014. ^ "Android and iOS Continue to Dominate the Worldwide Smartphone Market with Android Shipments Just Shy of 800 Million in 2013, – prUS24676414". idc.com. 12 January 2014. Archived from the original on 21 February 2014. Retrieved 13 January 2014. ^ "Android Pushes Past 80% Market Share While Windows Phone Shipments Leap 156.0% Year Over Year in the Third Quarter, – prUS24442013". idc.com. 12 November 2013. Archived from the original on 12 November 2013. Retrieved 12 November 2013. ^ "Apple Cedes Market Share in Smartphone Operating System Market as Android Surges and Windows Phone Gains, According to IDC – prUS24257413". Idc.com. 7 August 2013. Archived from the original on 9 August 2013. Retrieved 8 August 2013. ^ "Android and iOS Combine for 92.3% of All Smartphone Operating System Shipments in the First Quarter While Windows Phone Leapfrogs BlackBerry, According to IDC – prUS24108913". Idc.com. 16 May 2013. Archived from the original on 7 June 2013. Retrieved 14 June 2013. ^ a b "Android and iOS Combine for 91.1% of the Worldwide Smartphone OS Market in 4Q12 and 87.6% for the Year, According to IDC – prUS23946013". Idc.com. 14 February 2013. Archived from the original on 29 June 2013. Retrieved 14 June 2013. ^ a b "Android Marks Fourth Anniversary Since Launch with 75.0% Market Share in Third Quarter, According to IDC – prUS23771812". Idc.com. 1 November 2012. Archived from the original on 3 November 2012. Retrieved 14 June 2013. ^ a b "Android and iOS Surge to New Smartphone OS Record in Second Quarter, According to IDC – prUS23638712". Idc.com. 8 August 2012. Archived from the original on 3 June 2013. Retrieved 14 June 2013. ^ a b Android- and iOS-Powered Smartphones Expand Their Share of the Market in the First Quarter, According to IDC \u2013 prUS23503312 Archived May 30, 2012, at the Wayback Machine. Idc.com (May 24, 2012). Retrieved on 2012-07-03.